Lovely and elegant apartment is located in Via dell’Argilla, short and fairly characteristic street 15 mt. long, very close to the Vatican City and its S.Peter square (300 mt.). The houses along the street, aged 1920’s are totally renewed in the facades by typical roman colors. Because of its cultural and historical sites together with the several shops, supermarkets, bar and pubs, cinema and theatre, the distict is populated, daily and nightly, by pilgrims and tourist. Hundred and fifty metres from the apartment you will enjoy make shopping at the local open market, every morning except Sunday, where buying fresh fruits, vegetables and fishes is really economic and very characteristic. A new Carrefour supermarket has been recently open at only 50 meters and it remains open 24 hours a day 7 days a week (breakfast every morning is possible). Spagna steps, Navona square, Colosseum and other famous sites can be easily reached by bus to be taken 50 mt. from the apartment. My wife and myself take care personally of the management of the apartment since the year 2003 when we bought it. Completely review the apartment has all the administrative authorization and responds to the standard laws requirements. We get in touch with the client since the real beginning and run directly the check-in in order to introduce ourselves and to know the people that are going to spend their holidays in our property. A lovely apartment in a residential area just south of the Vatican. About 10 minutes walk away. We flew into the airport and caught the local shuttle bus to a stop just down the road.we then jumped on a local bus to the bus stop just outside the apartment. The apartment is on the third floor of the block. There are many shops cafes restaurants within 2 minutes. Apartment was large enough for myself my wife and my sister and brother-in-law. Excellent Wi-Fi, plenty of hot water and all very clean. Giorgio was very accommodating and responded to any messages I had very quickly. A very nice guy, so was his wife. We used the local buses quite a lot and there were plenty of them to all parts of the centre of Rome. I would definitely stay at this apartment again, and thoroughly recommend it. A good tip is to buy the local ATAC bus tickets at the airport from the railway station before you get the shuttle bus into Rome. the apartment is located very close to the vatican. clean and comfortable. I definitely recommend this place. el apartameto esta ubicado muy cerca del vaticano. muy limpio y cuenta con todas las comodidades , totalmente recomendado. We were very close to the Vatican which was nice but pretty far from everything else. We took cabs everywhere which was nice after walking so far in Florence, Positano and Venice. The apartment was clean and worked well for us. It was 66 steps up which was a hassle with luggage. In Italy if they say it is on the first floor, it doesn't necessarily mean it is on the ground floor. 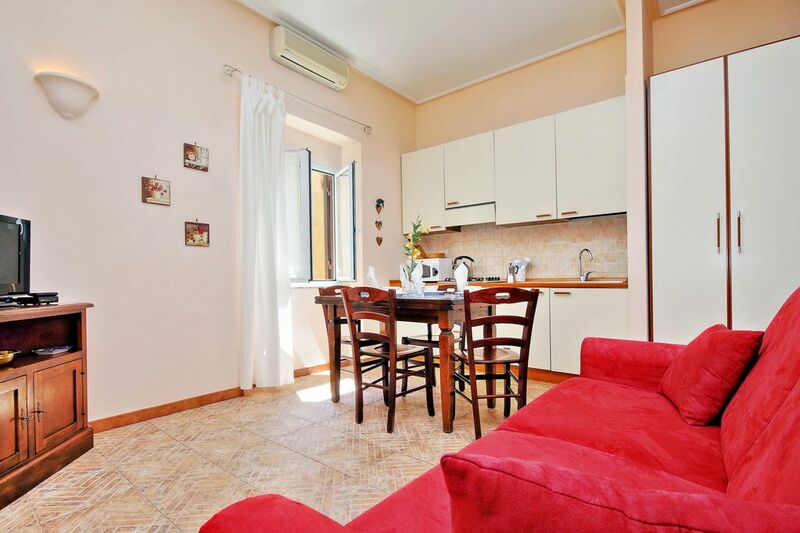 Warm and cozy apartment close to St. Peter's Square in the heart of Rome. The apartment is clean and well maintained. The owners were there to greet us and took time to make sure we had everything we needed. Grocery store, restaurants, bus stop close to apartment making it very easy. Thank you so very much! We were thankful to be able to have an early check in after a very early flight arrival and we were met and shown around. The property is not fancy but very convenient and cosy. We had everything we needed in working order. The supermarket close by was excellent as well. Would stay again should we find ourselves in Roma again. We spent 4 weeks in Giorgio and Graziella's apartment. They were lovely hosts, meeting us and explaining everything. The apartment was excellent. It was very clean and well-equipped (kitchen, washing machine, drying rack, etc). The bed was comfortable. The temperature was fine. Even on the few colder nights (it was January) the heater worked very well. The hot water was hot and the shower a good size. The Internet connection was very reliable and fast. The apartment was surprisingly quiet. Having a fresh food market open 6 days and a good sized Carrefour supermarket (24 hours 7 days) both within about 100 metres was good. Public transport into the old part of Rome was close - buses 100 metres away and Roma S. Pietro train station about 500 metres. There were plenty of restaurants, cafés and pastry shops close by. Everything added to make our time in Rome memorable. Transport from airport to the apartment and viceversa can be made , upon request by a private car service. Train : only from Fiumicino to Termini Railways station by Leonardo Express every 30 minutes, 35 minutes trip. Car : private car of the tourists can be left free of charge, on the street or at a private garage (150 metres far)at the special fare. At the 3rd. floor, without lift, is 50 sqm. to be used by maximum 5 people. Finished to be recently renewed is made of 3 rooms as 2 double bedrooms with king size bed (each 210x170 cm), 1 living room with corner kitchen and sofa-bed (195x135cm. ), 1 bathroom with shower. Refrigerator with minifreezer, microwave oven, radio, TV, indipendent heating and conditioning are available.